And at no time are the seasonal treats more enticing than at Christmas when traditional holiday sweets appear in the markets and pastry shops and even the supermarkets. Pastry shops assemble gift baskets with these confections and bottles of bubbly prosecco, and people scurry along the streets laden with bundles of delicacies to exchange with friends and families. The modern bread has its origin in Milano where rival bakeries began producing it commercially at the beginning of the last century. It’s baked in a cylinder about ten inches (25 c.) in diameter with a dome pouring over the edges of the top. The commercially produced panettone is packaged in cardboard boxes with little string handles, but the handmade versions in pastry shops is usually covered with paper or cellophane and tied with ribbon. ﻿﻿﻿﻿﻿﻿﻿﻿﻿﻿﻿﻿﻿﻿﻿﻿﻿﻿﻿﻿Pandoro is a close cousin to Panettone, but it is free of fruit and nuts and is generally covered in powdered sugar. 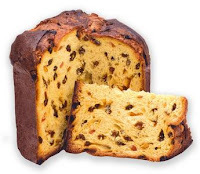 It’s as tall as panettone, but has a diverse shape, with triangular edges. There are many modern variations of the Pandoro, sometimes filled with chocolate or pastry cream laced with lemoncello. Panforte comes to us from 13th century Siena. Documents show that this dense fruit cake was paid as a kind of tax to monks and nuns of monasteries, due on February 7 each year. The cake is long-lasting and travels well, and evidence suggests that the Crusaders carried it for sustenance on their journeys. 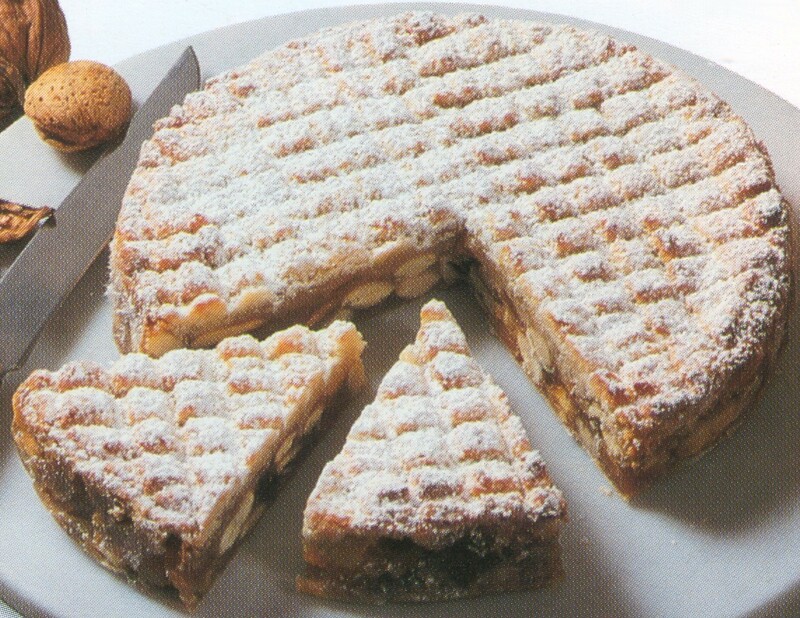 Panforte is made of figs, nuts, oranges, chocolate, honey, and many spices, including ginger. It is baked in a round tin and is coated with powdered sugar when it is done. Some commercially produced panforte are wrapped in rice paper. Panpepato is a precursor of panforte containing similar ingredients, minus the figs. The great variation is that ground black pepper joins the other spices in panpepato. This confection is baked in a little mound. ﻿Torrone is a sweet confection made from egg whites, honey, nuts (usually almonds or pistachios), and sometimes cane sugar. The more cane sugar added, the harder the torrone becomes. I prefer the soft variety because I like the taste, and my teeth can’t take the hardness. 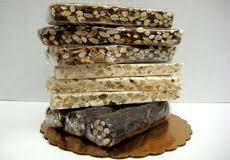 Sometimes, torrone has chocolate mixed with the nougat; other times the nougat is covered with chocolate. The history of torrone is a bit uncertain. There is evidence that the ancient Romans and Greeks, as well as the Arabs, made similar confections. The Romans, at least, used it as an offering to the gods. But the name derives from the October 25, 1441 wedding between Bianca Maria Visconti and Francesco Sforza from two of Italy’s great noble families. The father of the bride offered a vast dowry, including the city of Cremona itself. The pastry chef prepared a replica of the city’s bell tower in nut-covered nougat, calling it “torrione” which has settled to torrone.